Today EU-Kyrgyzstan human rights talks are scheduled to take place in Brussels. International Partnership for Human Rights (IPHR) urges the EU to address the disturbing pattern of stigmatization, harassment and reprisals targeting those who are critical of the current situation in Kyrgyzstan, as well as to call on the authorities of the country to stop this negative trend. “We are alarmed about the growing attacks on those who speak up against injustice, abuse of power, aggressive nationalism and other treats to democratic progress in Kyrgyzstan,” said Brigitte Dufour, IPHR Director. “It is key that the EU makes it clear to Kyrgyzstan’s authorities that this course is not acceptable for a society aspiring to be a free and open one,” she continued. A briefing paper prepared for the annual EU-Kyrgyzstan Human Rights Dialogue by IPHR and its Kyrgyzstani partner Legal Prosperity Foundation highlights the worsening free speech and civil society climate in Kyrgyzstan ahead of the presidential elections coming up in October this year. Outgoing President Almazbek Atambayev, who is not able to run because of a constitutional term limit but who is seeking to preserve his legacy, has recently stepped up rhetoric against those who are critical of his policies and has accused them of threatening national stability and security. A number of independent media outlets, journalists and human rights defenders have faced crippling defamation lawsuits initiated by the General Prosecutor because of articles featuring unflattering remarks about the president. The claims against the Kyrgyz service of Radio Free Europe/Liberty were eventually withdrawn at the end of May after the president stated that its coverage had “improved”, but other similar lawsuits are still pending. Journalists Narynbek Idinov and Dina Maslova, as well as human rights defender Cholpon Djakupova have been barred from leaving the country pending the outcome of the proceedings in their cases. 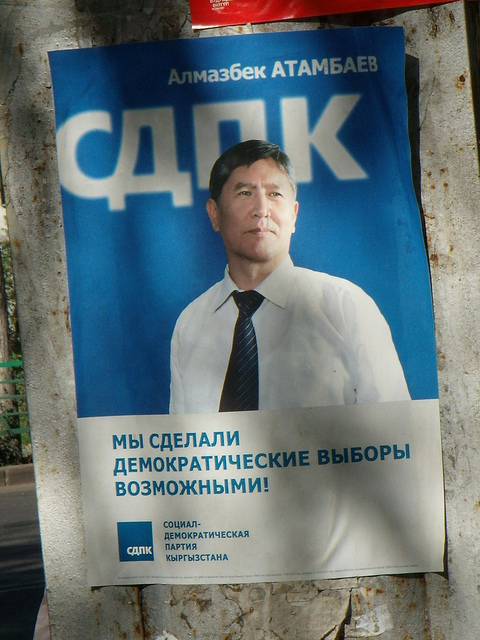 Outspoken Uzbek journalist Ulugbek Babakulov was subjected to a public smear campaign, labelled an ”enemy of the people” and charged with inciting inter-ethnic hatred after an article of his that was published on 23 May 2017 drew attention to aggressive nationalism against ethnic Uzbeks on social media in Kyrgyzstan. If found guilty on these charges, he could face a lengthy prison sentence. The independent, regional Fergana news site, on which the article appeared, was blocked in the country by court. Fearing for his safety, Babakulov has now fled Kyrgyzstan, saying that security service officials indicated that there are plans to initiate a “show trial” against him, similarly to in the case against imprisoned ethnic Uzbek human rights defender Azimjan Askarov. Askarov remains imprisoned for his alleged role in the June 2010 inter-ethnic violence in southern Kyrgyzstan after his life sentence was upheld at a re-trial in January this year, despite the lack of any credible evidence of his guilt. Prior to his arrest, he had documented looting, arson and attacks perpetrated during the inter-ethnic violence. Last year, the UN Human Rights Committee called for immediately releasing him and quashing his original conviction but this did not happen. “The case of human rights defender Azimjan Askarov has become emblematic of the miscarriage of justice after the June 2010 events in southern Kyrgyzstan,” said Brigitte Dufour, IPHR Director. “The new criminal case initiated against journalist Ulugbek Babakulov illustrates the serious risks that engagement on issues of ethnic intolerance and discrimination still entails in the country and should be raised as a matter of priority by the EU,” she continued. Most worryingly, Babakulov’s family has continued to be the target of surveillance and intimidation in Kyrgyzstan after he left the country. Other human rights defenders, lawyers and journalists, as well as their families have also been subjected to pressure in the country because of their efforts to document violations of the rights of ethnic Uzbeks, as well as to assist victims of such violations. Negative and suspicious attitudes toward foreign-funded NGOs remain prevalent in Kyrgyzstan, although the parliament eventually rejected a Russia-inspired bill last year that would have required all NGOs that receive foreign funding and engage in broadly worded “political” activities to register as “foreign agents”. Amendments to election legislation adopted by the parliament in May this year introduced new restrictions on NGO monitoring of elections. The new provisions restrict access of NGO monitors to polling stations and do not allow them to file complaints about violations documented, thereby unduly limiting civil society participation and decreasing transparency of the election process. In a number of recent cases, authorities have curtailed peaceful protests and detained protest participants in violation of the country’s liberally worded Law on Assemblies. Such violations have been documented during protests against threats to freedom of expression, the arrest of opposition politicians and other actions of authorities. At the same time, peaceful assemblies expressing messages in support of current government policies have been allowed to go ahead without interference. The downward trend in freedom of expression and other fundamental freedoms now seen in Kyrgyzstan is taking place as the country is preparing for presidential elections, scheduled to be held on 15 October 2017. While the elections are set to be competitive, unlike in other Central Asian countries, recent developments risk hampering the openness of the campaign and undermining public debate on issues of concern to citizens. Outgoing President Atambayev is supporting Prime Minister Sooronbai Jeenbekov, whom the governing Social Democratic Party has nominated as candidate. Others who have expressed interest in running include former prime ministers and well-known opposition politicians, some of whom are currently behind bars. For more information about current challenges to freedom of expression, association and assembly, as well as human rights defence in Kyrgyzstan, see the briefing paper prepared by IPHR and LPF for the EU-Kyrgyzstan Human Rights Dialogue. See also IPHR overview of the case of journalist Ulugbek Babakulov.